Over 75 young women from several high schools in the Inland Empire participated in the day-long educational event, culminating in a performance that showcased their accomplishments. Tomi McEvoy, a Sweet Adelines International Quartet Champion and the Director of the Inland Empire Chorus, served as clinician for this event and directed the evening’s show. First place Regional Quartet Winner, C’est La Vie, provided coaching and encouragement throughout the day, sharing their stories and love of a cappella singing. For the evening’s show, the girls were joined onstage by two Regional Champion Quartets, 4th place Parfait and 1st Place Winner C’est La Vie, along with the Inland Empire Chorus. 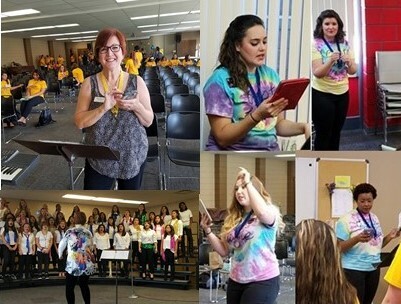 The Chorus, which has been performing a cappella harmony in the Inland Empire for over 60 years, created Harmony Stars Day to educate and encourage young singers. Each year this event grows in popularity, attracting new singers and those returning for another fun day of singing 4-part a cappella harmony.